This week, let’s talk Worlds Championship Team skins, suppressions, and executes. How do you decide on the Worlds winner’s skins? Oh hello, this question! It must be World Championship Team skins time! Over the last year, we’ve evolved and updated our approach to selecting the skins we make to celebrate the team and players who win Worlds. As teams continue to experiment with their rosters, we’ve had to reevaluate our criteria for the skins. Participate in at least 2 play-in stage games that had an impact on the team’s advancement to the knockout game (i.e. those games had to matter for seeding or advancement). Participate in at least 2 group stage games that had an impact on the team’s advancement to the knockout game (i.e. those games had to matter for seeding or advancement). Participate in at least 1 knockout stage game (Quarters, Semis, or Finals). We also have a few criteria for which champions players can choose. The most important is that the player must have played the champion at least once during Worlds. The player can choose any champion that they played, even if it was only once. If the winning team already has a skin for that champion from a previous win, we might ask for another option. 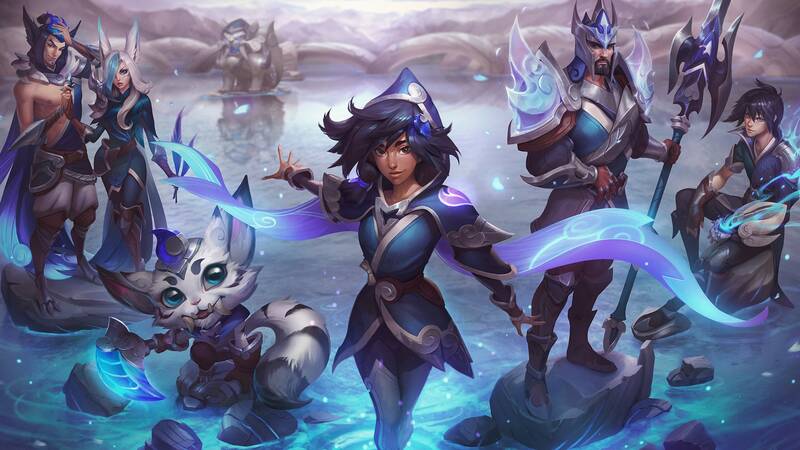 In the case of champions where we already have skins planned or in development, this no longer affects their eligibility for a championship skin. That’s a policy we changed last year, namely with SKT Jhin. Unless there are extraordinary circumstances, we limit the number of World Championship Team Skins to six per year. And then we’ve got the coaches. We save in-game coach content for something truly special. For example, if a coach has won three championships, they will be considered for in-game content. Lastly, let’s chat briefly about theming. Up through 2016, the theme for the skins was “Esports!” After receiving feedback around the 2016 SKT World Championship Team skins, we realized we had an opportunity to do something more compelling with our theming and allow for a broader reach to players who like a particular fantasy beyond jerseys, laptops, and headphones. We worked with SKT in 2017 and SSG this last round to create a skin fantasy that reflects their tastes and attitude as a team. It’s a crazy challenge for sure, but one we think is really paying off as the quality of these skins (from what you’ve told us) is just better. 2017 World Championship Team SSG skins are just around the corner! Why doesn’t crucible remove suppression? There’s a great case to be made that Mikael’s Crucible should remove suppression. As its cleansing effect has become more similar to QSS’s over time (now that QSS no longer universally removes all debuffs on the user, and instead just CC effects), it makes more sense that it would remove the same effects. The primary consideration to make around such a change is how champions that heavily rely on their suppressions would be negatively affected, since it’s much easier for a single support to pick up a crucible than it is for a full team to pick up QSS. Despite that consideration, it’s probably a significant increase to clarity of mechanics, and the power of the effect is tunable through at least active cooldown and total cost of the item. That said, the impact of the change could be pretty disruptive, so it’s unlikely to change in the immediate future. Why does Pyke have an indicator to show when his ult will execute people, but Darius and Urgot don’t? While we try to have parity and consistency across champion mechanics when possible, there are often exceptions to every rule. When it comes down to decisions like these, we have to take into consideration every aspect of a champion and remember to not just look at each ability in a vacuum. Each champion (and each ability) has its own needs and goals. For Darius, a part of his gameplay revolves around the ambiguity of whether or not his ultimate will kill a target. It adds excitement to the spell and is a way players express their skill and mastery by learning the perfect moment to land a killing blow as soon as possible. For Pyke, we had different goals. A large reason we added the gold sharing mechanic was as a social release valve. We didn’t want to create a lot of unneeded friction between members of the same team because a support was taking all the gold. If Pyke’s ultimate was very difficult to pull off, we wouldn’t really be relieving tension between teammates as often as we’d like. His ultimate is also a skillshot, because we wanted to allow enemies to have a response and we wanted Pyke to feel awesome when he’s able to land a kill. If he doesn’t land the killing blow, it can put him in a very risky situation by blinking onto a target he expects to be dead. Additionally, Pyke is very fragile compared to Darius and Urgot. He lives on the razor’s edge. He needs to know “right now!” if his ult will kill someone because it can easily be the difference between his death or a pentakill. All of this together meant that we didn’t really want to ask Pyke players to also judge the HP kill threshold themselves. There are already a lot of other skill tests they are undergoing with this spell (and elsewhere on the kit). That said, we have seen this question a lot and have been talking internally about Urgot’s ultimate. We don’t feel like a players ability to judge “Yup, that looks like 25% to me!” is an important skill test for them either. So we will be adding the same kill indicator on enemies’ HP bars for his ultimate in a future patch.